To provide the world’s best open resources accessible without language barriers. To build a network of active translators to support translation needs. To provide high-quality translations through an assessment and review process. To identify important resources that should be available for translation. To develop a workflow for individual and collaborative translation. To implement a review system to improve the quality of translation. The project translates astronomy outreach and educational materials from educational resources, articles, photos, games, applications, citizen-science projects, and IAU-specific content to support a wider reach. Check our available and translated resources here. * When we secure funds, we will develop a web platform to handle the workflow and database on a management system. At the core of the Astronomy Translation Network is the volunteer force. 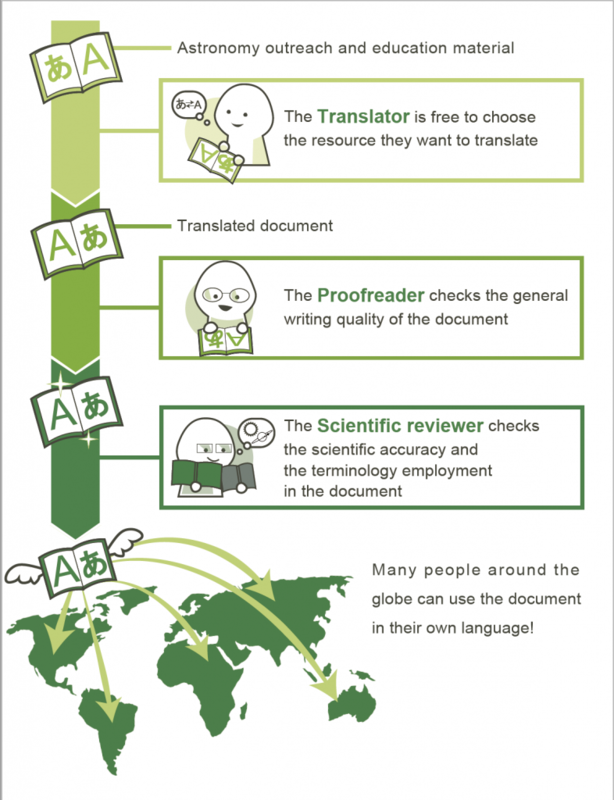 There are four ways to contribute to translation activities. Your translation will help to promote astronomy education and outreach around the world. You also can gain language skills, knowledge, and access to companies through volunteering. In addition, we are planning to create a certification system for volunteers, which will issue certificates in recognition of your volunteer work.